). My own session I led today was all about networking effectively, and throughout the weekend I was continually impressed by the power and diversity of the South Asian network and just how much of a difference many people from it are making in the world. One of the best stories to come out of the event was about a nonprofit organization that you may not be familiar with, but by all accounts it is one of the most ambitious, largest and stunningly successful in the world. 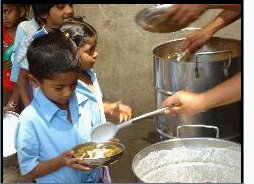 Akshaya Patra Foundation has a very simple goal … to end the cycle of powerty in India by feeding 1 million school children in India every day. To really understand the scale of this, imagine the catering that goes into feeding an entire Superbowl stadium of people, then multiply it by 12. Doing anything for 1 million people on a daily basis is a near impossible task, and yet Akshaya Patra has pioneered a model for doing it that many other NGOs are now looking at as a template for launching similar efforts. The real power of this idea comes from it’s simplicity. If you can offer hot meals to children every day, you are providing an incentive for them to come to school each day. If they come to school, they can end their cycle of poverty. Aside from telling you about this foundation, this post is actually an extension of a call for help that one of the speakers at the NetIP event made. Akshaya Patra is one of the causes that you can vote for in the American Express Member’s Project campaign. If they are one of the top vote getters in the contest, they have a chance to win a $1.5 million grant from American Express. Below is a great video that will give you a bit more insight into how Akshaya Patra works (including a look at their bread maker that can churn out more than 10,000 roti’s per hour). Check it out and consider voting for them sometime before midnight on September 1st and help them fulfill their mission of feeding 1 million schoolkids each day. Disclaimer: American Express is an Ogilvy client, but I do not currently work on any projects for them and have never worked on anything relating to the Member’s Project.